During each injection molding cycle, molded parts need to be released from the cavity by ejection system, it is also called de-molding system, design of ejection system affect product quality and production efficiency. 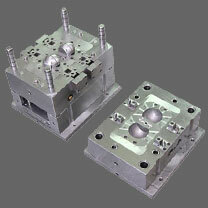 ejection plate, fixation plate, mold base plate. screws to fix the these plates. ejector pin, ejector block, sleeve. 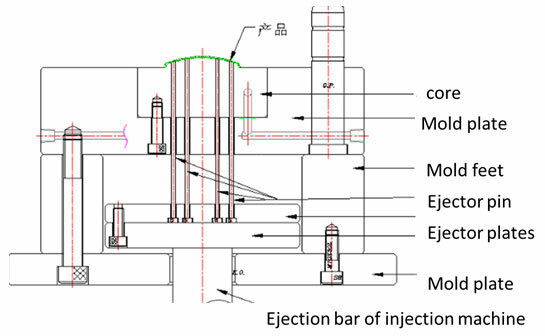 Ejection distance is normally defined at 5-10mm, or 2/3 of the length of some of the plastic parts with big draft angle. When no special ejection problems are expected, the standard ejector pin will perform well, a sleeve ejector is used to provide uniform ejection around core pin. A central valve ejector is frequently used combination with air ejection on cup shaped parts where vacuum might exist. The air valve is thus only a secondary ejection device. A stripper plate or ring is used when ejector pins or valves would not operate effectively. The stripper plate is often operate by means of a draw bar or chain.